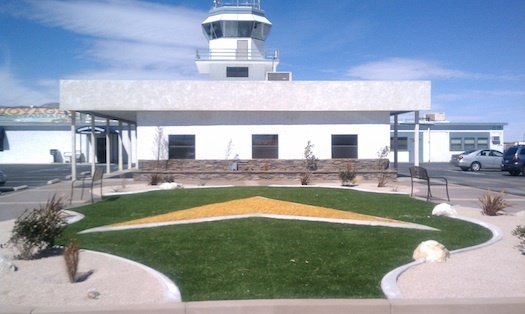 The Mojave Air and Space Port is making a series of infrastructure improvements designed to enhance services for existing tenants and users and to lure new companies to the High Desert test center. The projects include improvements to two of the airport’s three runways, the extension of utilities to new areas, the installation of high-speed Internet services, and the development of a large building for meetings and special events. The airport is receiving $4.319 million in FAA grants to upgrade runways 4-22 and 8-26. Runway 4-22 is the shortest landing strip at the airport at 3,943 feet and is in the worst shape. It will be rebuilt and outfitted with lights this fall, said spaceport CEO and General Manager Stu Witt said. Once work is completed, it will serve as an excellent crosswind runway. The recently approved East Kern Airport District (EKAD) budget also includes $400,000 to extend electricity and water to the north side of the airport and $100,000 to extend water to the east side. The north side has rocket test facilities and an aircraft boneyard. Witt has said that expanding utilities could quickly generate an additional 50 jobs. The improvements will also open up new areas of the airport for development. Meanwhile, Race Communications is working with High Desert Wireless to extend high-speed Internet service to the spaceport’s offices and tenants. The spaceport already has a fiber network installed. Race is connecting that network to a main data line it has extended up from Los Angeles. It will also extend the airport’s existing fiber network to buildings constructed since the system was installed. Race Communications CEO Raul Alcaraz said service will be rolled out by October. The company plans to make the Mojave Air and Space Port into a hub for extending high-speed services throughout the local region, he added. Members of Revitalize Mojave, a Chamber of Commerce sponsored effort aimed at improving the business district in the adjacent town of Mojave, hope the hub will be an incentive for new businesses to locate there. During an EKAD board meeting on Tuesday, Witt reacted positively to a suggestion that Internet be extended to the east and north sides of the airport along with the electricity and water utilities. He will look into costs and feasibility. The airport also is continuing renovations of the pool building, a large structure where the Navy once conducted water survival training for its pilots. Witt said that a lot of work has been done to improve the structure. A major part of the project involves replacing the building’s uneven floor, which Witt estimated could cost up to $100,000. Tenants are already lining up to use the building, which is the only structure on the airport large enough to host big meetings and special events, Witt said. The structure will be a major asset to the airport once renovations are finished. He estimated that improvements on the structure could be completed by the end of the year. In the meantime, the property is being leased out for dry storage. Witt said that he didn’t price in a kitchen for the building. Kitchens are costly, and there are a number of quality catering services in the area that can deliver food and drinks. He added that he and his staff are weighing options on a sound system for the building.